The HCSS load shackle range from PT weighing systems is a superb range for suspension weighing and for measuring tension is cables and anchorages. The SLSP is fitted to a Hi-Load shackle with sleeve and anti-rotation plate. 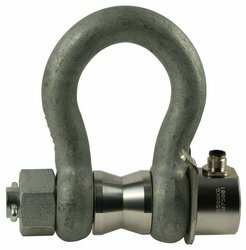 Available in weighing capacities 6.5t, 12t, 25t and 55t, all with industry standard shackles and high safe load the HCSS comes complete with mating connector, requiring only the addition of cable and a display.